California Conventions Blog: And Now for Something Completely Different! Ramen Yokocho 2014! For those who don’t know, Ramen Yokocho is a ramen festival where restaurants from all over the United States and Japan come to sell ramen and promote their businesses. There were six restaurants from right where I live in Los Angeles, California, two from Las Vegas, one from San Diego and four directly from Japan. Unfortunately, I was unable to visit all of the booths, but even more unfortunately, I was unable to visit any of the booths from Japan. I wound up visiting one from Los Angeles, and two from Las Vegas. 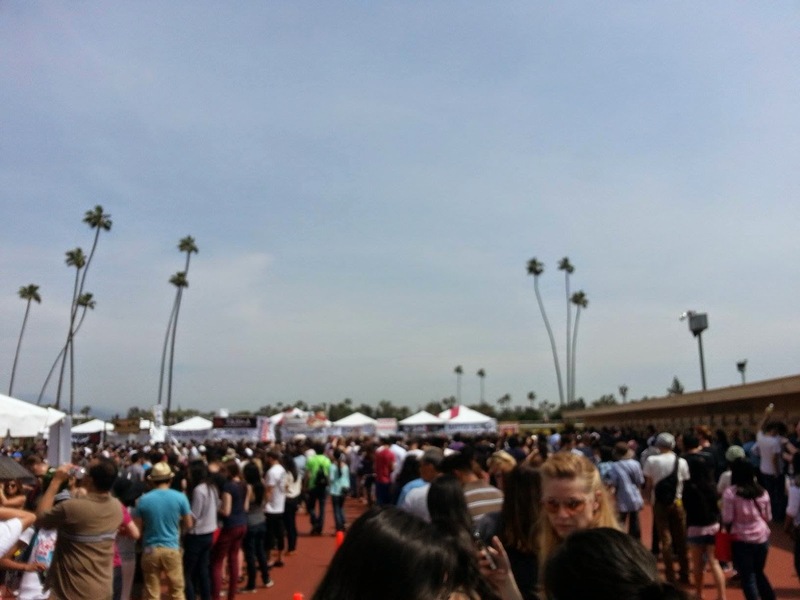 It was hosted in the middle of the Santa Anita race track, which was really cool because there was a horse race going on at the same time, so occasionally you could see the horses run around the perimeter of the festival. There were other things to do besides standing in line for ramen, like the Japanese tea ceremony, but by the time I had gotten ramen, the ceremony was done. For the non-ramen lovers, there were a bunch of food trucks, but I only caught a glimpse of them before I went to line up for ramen, so I’m not sure what they were selling. There were a lot of attendees at the festival, so it was the equivalent of Line Con when I went, which was at about 3PM. I didn’t realize until a little after I had stood in a line for ramen that you actually had to buy tickets first, and the ramen booths took tickets instead of money at the booths. So I had to get out of line, stand in line to buy my tickets (which was cash only) and then stand in another line to actually get the ramen. Now I’ve never done a review on food before, so I’m not exactly sure what to talk about. The most distinctive thing I ordered was the Ramen burger, from Fujin in Los Angeles. It’s like a regular hamburger, but instead of hamburger buns, it is replaced with ramen that has been cooked, shaped and then fried or baked back into a bun shape. To some it may sound disgusting, but it was amazing. There were a bunch of sauces on the burger, now I don’t know about others, but I’m a sucker for sauces. Mustard, mayo, ketchup and a Japanese sauce which was kind of like tonkatsu sauce or a soy sauce reduction, but I’m not really sure what it was. It wasn’t drippy like my description may sound, but you could taste everything in every bite, which is always great. The patty part was just okay, but I have to give them some credit. I waited in line for two hours, and they were making burgers the entire time. After the two hour wait I was ready to chow down on more food as I hadn’t eaten all day, so we went for the two shortest lines possible that weren’t restaurants we could visit in L.A.
Blurry cell phone picture! There is where we were in line after an hour of waiting for Ramen Burgers! We wound up at Monta, which was a booth from Las Vegas. They had a “tonkotsu soup combin[ed] with chicken and vegetable stock”, which was fantastic. I think of all the noodles that I tried, this one was my favorite. They had a noodle making machine on display outside of their booth, which I thought was interesting. You stood in line for the noodles, handed the person at the window a meal ticket, where they would exchange it for a pair of chopsticks, a spoon and a napkin, then head to the other window to wait in another line for our ramen. In reality it was probably possible to just stand in that line with all the utensils from a different booth and gotten a free bowl of ramen, but everyone I saw was very honest and did not do that. The last booth we went to also had ramen, but neither my friends nor I liked it very much. I don’t remember the name of it, but I do remember the part none of us liked. There was a lot of sesame oil sitting on top of the soup, but it was much too potent. And I suppose sesame oil is an acquired taste, because my friends that had never had it before said it was really weird. Even though I grew up with it at home, I don’t love it, but my brother does. Overall the ramen festival was a success. I definitely want to go again next year, but I would want to go earlier in the morning, along with a huge group of friends so we could sample every ramen there. Sadly I didn't take any pictures of the food because I was too eager to eat it.